Abdel Fattah is not a well-known figure across Egypt, but archaeologists told Bikyamasr.com that they believe he will be a solid replacement and is not as controversial as Hawass. Abdel Fattah told local newspapers that he would complete several unfinished construction projects, while cautioning that others would have to be postponed because of a lack of money. The love is mutual between Aussies and Tutankhamun, with the Pharaoh breaking visitor records at Melbourne Museum and extending his stay until 4 December this year. Welcoming up to 500,000 since it opened in April this year, the Tutankhamun and the Golden Age of the Pharaohs exhibition originally dated to leave early November, will stay the extra month down under before leaving for his permanent residence in the new Museum in Egypt. The exhibition shattered Melbourne Museum records before it opened earlier this year, with up to 150,000 tickets pre-sold and exceeding 500,000 visits before the end of the second last month. Libyans are being warned to guard against looting of their cultural heritage amid the country’s turmoil. The director of the UN cultural agency is also cautioning the international art and antiquities trade to be “particularly wary of objects from Libya in the present circumstances” because they might be stolen. She warned that past conflicts have led to looting and damage to artefacts and archaeological treasures. With thanks to Larry Rothfield's blog for highlighting the relevant paragraph. The opposition National Transitional Council (NTC) said on Tuesday that guards from a specially trained Tripoli brigade, made up of fighters from the capital, were being stationed at the national museum as well as other key cultural sites. Parts of Libya's cultural heritage have been threatened before: in the 1950s, two British soldiers stationed in the country when it was a British protectorate took a selection of ancient relics back to the UK. The items, some of which were up to 2,500 years old, included the bronze prow of a Greek ship found during a diving excursion off the coast of Benghazi. They were returned last year as part of an ongoing Libyan effort to secure the return of its treasures, many of which were removed during the colonial era. The current civil litigation surrounding whether the Ka-Nefer-Nefer mummy mask is contraband is worth following given the current legal arguments in play. The mask, located at the St. Louis Art Museum (SLAM), is claimed by the federal government to be contraband, which is always unlawful to possess. SLAM, meanwhile, argues that the mask, if it is contraband, must be considered derivative contraband, compelling the government to prove that the mask was utilized in the commission of a crime. It is open to discussion whether the mummy mask fits into the same category as contraband like illegal narcotics. It is also remarkable to think of the mummy mask as derivative contraband like a car used in illegal gun running. It may be that both legal theories are inexact. The mummy mask might be categorized as proceeds or fruits instead. Thanks as usual to John Rauchert for sending me the latest contents. Presenting a large body of evidence for the first time, this book offers a comprehensive treatment of Nubian architecture, sculpture, and minor arts in the period between 300 BC-AD 250. It focuses primarily on the Nubian response to the traditional pharaonic, Hellenistic/Roman, Hellenizing, and “hybrid” elements of Ptolemaic and Roman Egyptian culture. The author begins with a history of Nubian art and a critical survey of the literature on Ptolemaic and Roman Egyptian art. Special chapters are then devoted to the discussion of the Egyptian-Greek interaction in the arts of Ptolemaic … read moreEgypt, the place of Egyptian Hellenistic and Hellenizing art within the oikumene, the pluralistic visual world of Ptolemaic and Roman Egypt, as well as on the specific genre of terracotta sculpture. Utilizing examples from Meroe City and Musawwarat es Sufra, the author argues that cultural transfer from Ptolemaic and Roman Egypt to Nubia resulted in an inward-focused adaptation. 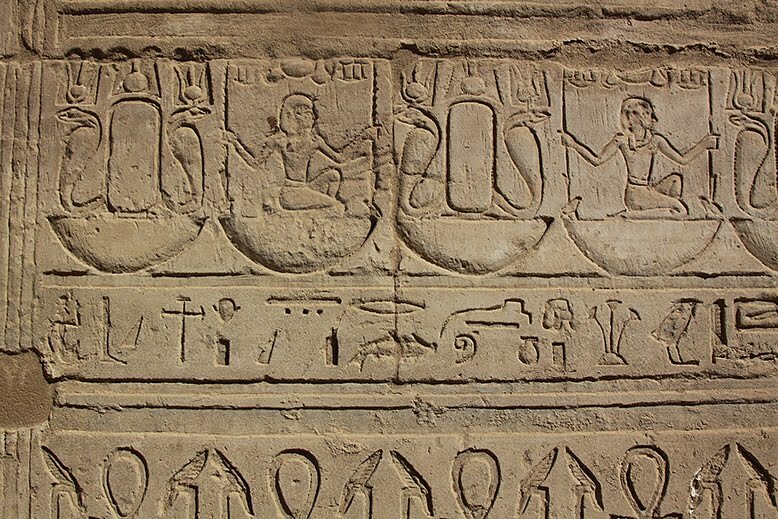 Therefore, the resulting Nubian art from this period expresses only those aspects of Egyptian and Greek art that are compatible with indigenous Nubian goals. 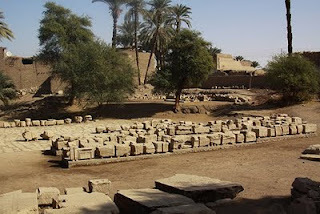 One of the seven cities in Revelation; the possible site of Zechariah’s tomb; the Avenue of the Sphinxes in Luxor; and a Coptic monastery in the Egyptian desert. What do all they all have in common? Ancient churches have recently been excavated at each of them. Each has its own story to tell, including a case of some beautiful but tragic mosaics. Mohamed Abdel Fattah, the head of the antiquities sector at the Supreme Council of Antiquities, will become the council’s secretary general, the position Mr. Hawass held before former President Hosni Mubarak elevated the council to a ministry. Mr. Sharaf had previously indicated that he planned to return the council to its former status. Mr. Abdel Fattah is expected to wield less power than Mr. Hawass, a media celebrity who was credited with increasing tourism and securing the return of antiquities from foreign museums and collectors. Mohammed Abdel Fattah was already leading the antiquity department of the SCA. He previously served as head of the Museums sectors and director of Antiquities in Upper-Egypt. So far, the response to this appointment seems to be cautiously positive, unlike the sharply negative response to the previous nomination of non-archaeologist, Abdel-Fattah El-Banna, to the same post. The announcement sparked controversy and had immediately been rescinded. Now the council is in the hands of Fattah, who previously served as the head of the antiquities sector at the Supreme Council of Antiquities, a vague and tautological job description that is just about the only background information provided. Fattah says that his agenda will be to make peace among the council members, to take on corruption, and to prioritize construction on projects such as the Rams Road in Luxor, the Step Pyramid, and the Sharm el-Sheikh Museum. As for the question of government salaries, he announced that the country's central bank had given him a loan of 350 million Egyptian pounds ($59 million) for this purpose. What’s Next for Egypt’s Artifacts? As they were dead, the mummies were ultimately O.K., but the news hinted at a question that would become increasingly pertinent in the coming months: what were the implications of the revolution for those who work with Egyptian artifacts the U.S.? In the subsequent months, we’ve learned more about the provisional government’s attitude toward its cultural artifacts. The Supreme Council of Antiquities (S.C.A. ), the organization responsible for handling such matters, was downgraded from a cabinet ministry. Its prominent and outspoken head, Dr. Zahi Hawass—famous for his Indiana Jones fedora and soapbox passion for repatriation—said in March that he would step down. The impending departure of Dr. Hawass, the face of modern Egyptian archaeology, indicates a shift in the way Egypt will handle its artifacts. Not much is known about Mohamed Abdel Fattah, the man appointed his successor just this week, and the question remains as to how Dr. Hawass’s successor will navigate the tricky role of being both a goodwill ambassador and a staunch nationalist faced with colleagues who own works that, spiritually, still belong to his country. SLAM's attorneys describe two kinds of contraband. They explain that there is contraband per se, which include items illegal to possess under any circumstance (author's note: think of counterfeit money) and which can be automatically confiscated by the government without a hearing. They also say that there is derivative contraband, which include lawful items that are forfeitable because they are connected with a crime (author's note: think of a car used in drug trafficking). SLAM argues that if the mask is in fact contraband, then it must be characterized as derivative contraband that is not automatically forfeitable. Because the mask is not automatically forfeitable contraband per se, SLAM argues that the government must present evidence that the object is forfeitable as an item that derives from a criminal act. Sunbathing in Alexandria may soon be a thing of the past, at least if some Egyptian Islamist politicians have their way. Egypt's tourism industry has suffered a severe blow since the outburst of anti-regime demonstrations in January. But that did not stop the Freedom and Justice Party, the political wing of the Muslim Brotherhood, from demanding stricter regulations over what tourists can do and wear while visiting the country. The party is urging officials to ban skimpy swimwear and the consumption of alcohol on Egyptian streets. . . . But bathing suits are not the only worry of Egypt’s Islamists. Abd Al-Munim A-Shahhat, a spokesman for the Salafi group Dawa, has said that Egypt's world-renowned pharaonic archeology – its pyramids, Sphinx and other monuments covered with un-Islamic imagery – should also be hidden from the public eye. Following the 25 January Revolution and the drastic decrease in tourism to Egypt, the income of the Supreme Council of Antiquities (SCA) reached its lowest level ever and its budget had to be curtailed. This meant that all development and restoration works in progress had to be put on hold. Among these projects were the structural repair and reinforcement of the inner chambers of Djoser's Step Pyramid at Saqqara and the rehabilitation work of the renowned Graeco-Roman Museum in Alexandria. Media rumours too have taken their toll. It was claimed that delays in processing payment to companies carrying out restoration work on both projects had led to work being neglected. 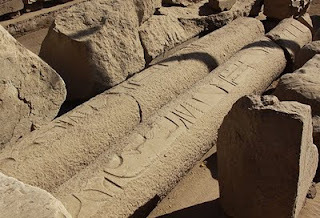 Blocks in inner chambers of Djoser's Step Pyramid were falling, while some pieces in the collection of Alexandria's Graeco-Roman Museum that had been moved further along the coast to the Marina archaeological galleries were deteriorating because of poor storage conditions. Comprehensive four-page overview of the case and its history. Germany and Egypt have long been at odds over the return of the famous bust of Nefertiti. Now documents found in archives show that the conflict was started by a Frenchman who had fought the Germans in World War I and considered them to be swindlers. He may have been right. This queen owes her immortality to a gifted artist. The bust he fashioned out of gypsum and limestone some 3,350 years ago became an eternal monument to her beauty. As realistic as the image is, it has the radiance of a goddess. "It's no use describing it; you have to see it!" said the German archeologist who unearthed the bust of the Egyptian queen in the desert sand almost a century ago. Hardly anyone is familiar with the name of the sculptor, Thutmose, but the bust is of the famous Nefertiti, Queen of the Nile, Great Royal Wife of the Pharaoh Akhenaten. And thanks to a coincidence, a minor detour of history, her likeness is not on display in a museum in her native Egypt, but in Berlin. Or was it not a coincidence at all, but rather fraud? For the Germans, Nefertiti is their perceived property, a national cultural treasure, their entry in the canon of the sublime. The bust represents many things, but most of all it stands for both the splendid epoch of ancient Egypt and the age of spectacular digs around the beginning of the last century, when Europe's archeologists set out for the Nile. Today, she is the star of the Neues Museum in Berlin's Mitte district, which was reopened in 2009. There, the bust is prominently displayed in the middle of a domed hall, bathed in soft light and admired by thousands every day. Of the more than 1 million visitors the museum attracts each year, most come to see the bust of Nefertiti, as if they were making a pilgrimage to admire this queen of the Nile. Nefertiti is Berlin's Mona Lisa, except that she is perhaps even more beautiful, more mysterious and more magnificent. Of course, the Egyptians would prefer to have this heirloom of their magnificent history in their own country. A giant 4,000-year-old Egyptian visitor looms over the crowd of live humans milling antlike throughout the vast entry hall of the Metropolitan Museum of Art. He is an extraordinary specimen of regal manhood. Carved from a single block of dark gray granodiorite, he sits in a form-fitting kilt on a cubic throne covered by hieroglyphics. He has the broad shoulders, narrow waist and muscular legs of a well-developed athlete. Sporting a headdress of folded striped fabric, he gazes out over the masses with imperturbable self-assurance and open eyes set in a round, youthful face. He is as thrilling as anything in the Met’s great Egyptian collection. Scholars think this 10-foot tall, almost nine-ton monument originally portrayed the 12th-dynasty pharaoh Amenemhat II, who reigned from about 1919 to 1885 B.C. Later artists evidently altered the facial features to make him more like Ramesses II, the king who ruled from about 1279 to 1213 B.C. He has belonged to Berlin’s Egyptian Museum and Papyrus Collection since 1837. But now the courtyard in Germany where he usually presides is under reconstruction, so he will be a guest of honor in New York for the next 10 years. Closing last month after a three-month stint at the Musee des beaux-arts in the southern French city of Lyon, Le genie de l'Orient, l'Europe moderne et les arts de l'Islam was an ambitious, wide-ranging exhibition that invited visitors to rethink much of what they might have been told about the relationship between Europe and the Islamic world in the 19th and early 20th centuries, including about the sometimes thorny topic of European orientalism. While the exhibition included materials from the fine and visual arts, notably from the orientalist picture-making associated with the French painter Jean-Leon Gerome, the emphasis of the exhibition lay with the European decorative arts and particularly with what European designers, architects and decorators may have been looking for in the arts of Islam and what they may have taken from them. The corpus delicti is a plain flacon from among the possessions of Pharaoh Hatshepsut, who lived around 1450 B.C., which is on exhibit in the permanent collection of the Egyptian Museum of the University of Bonn. For three and a half millennia, the vessel may have held a deadly secret. This is what the Head of the collection, Michael Höveler-Müller and Dr. Helmut Wiedenfeld from the university's Pharmacology Institute just discovered. After two years of research it is now clear that the flacon did not hold a perfume; instead, it was a kind of skin care lotion or even medication for a monarch suffering from eczema. In addition, the pharmacologists found a strongly carcinogenic substance. Was Hatshepsut killed by her medicine? When Michael Höveler-Müller became the curator of the Egyptian Museum of the University of Bonn in 2009, it occurred to him to examine the interior of the vessel that, according to an inscription, belonged to Pharaoh Hatshepsut. Its neck had been blocked with what was generally considered "dirt," but Höveler-Müller suspected that it might also be the original clay stopper. So possibly, some of the original contents might still be inside. In Dr. Helmut Wiedenfeld from the Pharmacy Institute, he found just the right partner, to get to the bottom of this question and of the flacon. At the Radiology Clinic of the Bonn Universitätsklinikum, the flacon was subjected to a CAT scan. Here, the Egyptologist's suspicion was confirmed – not only was the closure intact, but the vessel also held residue of a dried-up liquid. In the summer of 2009, Professor Dr. Friedrich Bootz from the Klinik und Poliklinik für Hals-, Nasen- und Ohrenheilkunde (laryngology, rhinology and otology) of the University of Bonn took samples, using an endoscope. The Egyptian queen Hatshepsut might have accidentally poisoned herself with skin lotion, according to a new study. 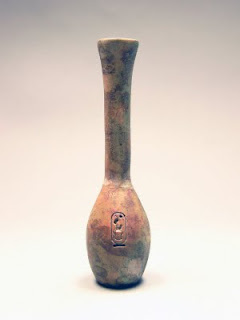 Researchers have detected a highly carcinogenic substance in the dried contents of a cosmetic vial found among the female pharaoh’s possessions. One of ancient Egypt’s most powerful rulers, Hatshepsut is thought to have died of bone cancer in 1458 B.C. A flask of lotion believed to have belonged to the female pharaoh Hatshepsut contains a carcinogenic substance that might ultimately have killed the Egyptian queen, German researchers said today. 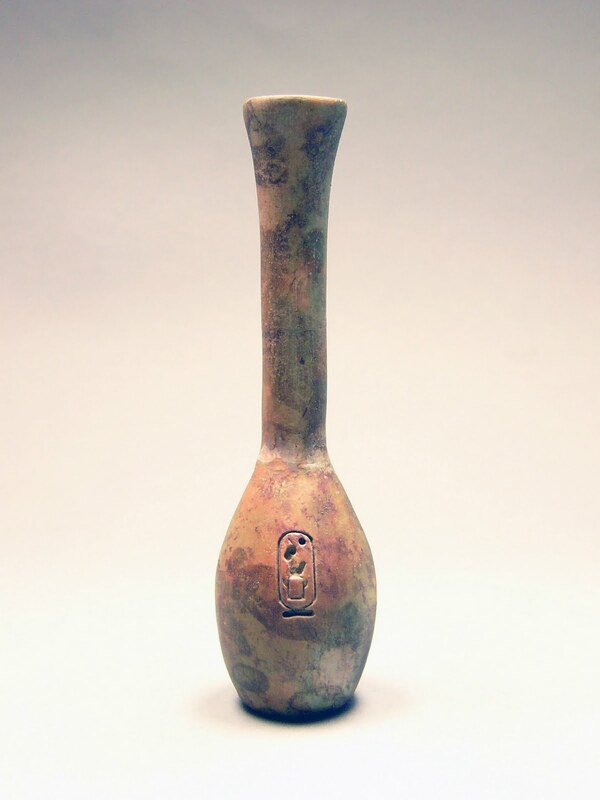 Part of the permanent collection at the University of Bonn’s Egyptian Museum, the vessel was thought to have held perfume until a two-year study uncovered traces of what appears to be an ancient treatment for eczema or psoriasis. Its ingredients include palm and nutmeg oil, fatty acids that can relieve certain skin conditions and a type of cancer-causing tar residue, which is also found in cigarette smoke. “We have known for a long time that Hatshepsut had cancer and maybe even died from it,” said Michael Höveler-Müller, the collection’s curator. “We may now know the actual cause.” He also said that other members of the queen’s family are thought to have suffered from inflammatory skin diseases that tend to be genetic. The Egyptologists' Electronic Forum (EEF) has posted the following update from the SCA, with my thanks to EEF for continuing to do such a great job. I don't normally republish items posted on EEF, because I assume that most of my readers will be subscribers, but this is an important statement that should probably be shared. In the last few weeks as you all watched and heard in the media that the Ministry of State for Antiquates returned back to be Supreme Council of Antiquates which has maintained its independence from the Ministry of Culture, it is reporting directly to the Cabinet and the Prime Minister. Mr. Mohamed Abdel Fattah is the Secretary General of the SCA and all official letters should be addressed to him. In the last days many rumors were widespread about stopping the work of the Foreign missions in Egypt, others saying that no more excavation will be undertaken in Egypt. Therefore, I would like to pay your attention to the fact that all what you hear or read is completely wrong, since you did not receive an official note from our department. 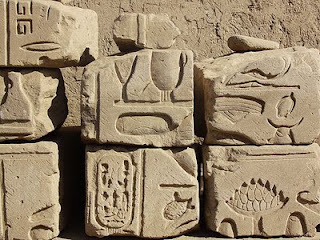 The SCA are not intended to stop any excavation work in Egypt, except for some sites which are under threat from robbery according to the security reports. Therefore, The Permanent Committee has suspended only some excavation work for some missions due to the security statues of each site. However, the study season or conservation and protection work are approved at all the sites. In other words, the SCA is dealing with sites case-by-case according to its security conditions. I would like also to inform you that our department is ready to receive any application and it is working with the same system as before. There is no change at all till further notice. 3. El Adel Abou Bakr St.
Prime Minister Essam Sharaf has resolved a crisis at the Supreme Council of Antiquities by appointing Mohamed Abdel Fattah as secretary general. The council was temporarily headed by Mohamed Abdel Maqsoud, who had no decision-making powers. Abdel Fattah promised to resolve differences among council members and root out corruption. He also vowed to complete a number of unfinished projects, such as the Rams Road in Luxor, the Step Pyramid and the Sharm el-Sheikh Museum. On a visit to the Ben Ezra Synagogue in Coptic Cairo today, the Geniza’s hiding spot is not hard to find. Just up on the top left corner of the synagogue’s back wall is a two-foot square opening. The unassuming hole leads to the small attic chamber where Schechter spent months, breathing in dust and slowly, carefully packing up the Geniza’s long-hidden scraps of poetry, personal letters, marriage certificates, divorce decrees, receipts and philosophical arguments that date as far back as 1000 years to bring back to Cambridge. The Geniza has yielded many works of scholarship on Jewish cultural and religious history, as well as important works of poetry, and its history has been chronicled before in other books. But perhaps authors Hoffman and Cole approached the project because they knew they could do it better than those who came before them. Tourism is one of the main sources of income in Egypt, but the January 25th revolution disrupted the industry. During the week that followed the Revolution, millions of tourists left the country causing losses estimated in the billions of dollars. Successful tourism by the international standards depends on safety, tranquillity and perhaps an educational cultural experiences. This led many Egyptians to wonder how Egypt can attract tourism again. Only the Minister of Tourism, Mr. Mouneer Fakhry Abdel Nour, can answer all questions about tourism in Egypt. In an interview that took place at his office on August 9, 2011 he answered the following questions. Following two months of the cancelation of the Ministry of State for Antiquities Affairs, Prime Minister Essam Sharaf appointed Mohamed Abdel Fatah the new Secretary General of the Supreme Council of Antiquities (SCA). Abdel Fatah was the head of the Ancient Egyptian Antiquities sector at the SCA. He previously served as head of the Museums sectors and director of Antiquities in Upper Egypt. I wonder what is happening to Mohamed Abdel Maksoud and whether he will still have a role at the SCA? He seemed to be rather more up front about the problems at the SCA than one has become accustomed to, and I found this apparent openness very welcome. I'll post anything new as it comes in. Ancient Egyptians wouldn't be caught dead without hair gel. Style in the afterlife was just as important as it was during life on Earth – and coiffure was key. To this end, men and women alike would have their tresses styled with a fat-based "gel" when they were embalmed. The evidence of their vanity has been found in a community cemetery dating back 3000 years. Tomb paintings depict people with cone-shaped objects sitting on their heads, thought to be lumps of scented animal fat. "Once we started looking [for these], we found interesting hairstyles," says Natalie McCreesh of the University of Manchester, UK. "The hair was styled and perfectly curled." She and her colleagues examined hair samples from 15 mummies from the Kellis 1 cemetery in Dakhla oasis, Egypt, and a further three samples from mummies housed in museum collections in the US, the UK and Ireland. After being the biggest open-air museum in the world since it was restored three years ago, Muizz Street in old Cairo turned into public car park due to the absence of security. Thus the Islamic monuments are threatened day after day by overcrowding, and the halls of mosques have turned into unlicensed open-air Cafeterias. "I saw a piece of stone break off Sultan Barqouq Mosque after a truck scraped its wall. The traffic movement negatively affects the archeological sites," Said the owner of a shop in the Islamic street. “Humidity could cause stones to fall from the mosque facade or shaking due to the traffic movement could cause damage,” said Mustafa Amin, head of Islamic Archeology in the Supreme Council of Antiquities. Amin added that some damage could be repaired. He continued there would not be a threat on the mosque itself as its substructure and sewer pipeline, fixed during previous restoration, were maintained but said car exhaust could damage the mosque’s facades. Rock art finds at Garet Shezzu and an aardvark? The relationship between the Iheren-Tahilahi/Wa-n-Amil Art and the Algerian Saharan Atlas. The significance of Garet al-Khalwa. Youm7 English Edition met one-on-one with Egyptian Minister of Tourism Munir Fakhry Abdel Nour on Tuesday, August 16. Minister Nour talked about Egypt’s recovering tourism, plans for development and his fears of the implications on tourism if an Islamic regime comes to power in the wake of Egypt’s January uprising. He also said tourism is where Egypt has the greatest competitive advantage. 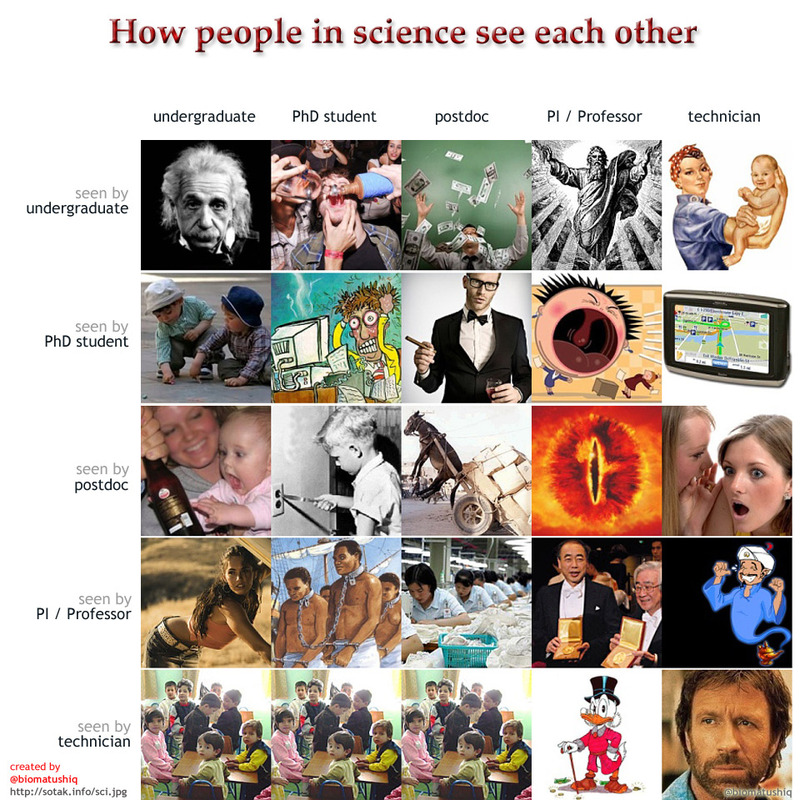 My weekly visit to Facebook produced the following gem, thanks to Hilary Orange, which is a very light hearted look at how scientists (and, I would think, most academics) see each other at each stage in the academic sausage-manufacturing machine. 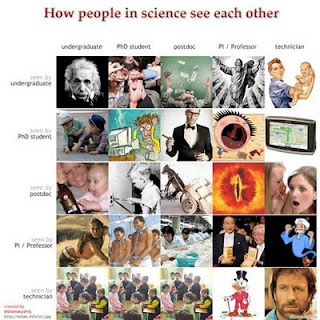 Go to the site and click on the image to expand it. A useful look at the current state of the SCA and how it got to its current position. The recent history of the antiquities authorities is indeed somewhat complicated. Archaeologists and tour guides in Luxor on Sunday demanded that Mohamed Abdel Maqsoud, general secretary of the Supreme Council of Antiquities, launch an international campaign for saving Kabash Road. Kabash Road connects Karnak and Luxor temples at a length of 2700 meters. People have illegally built on it since the start of Egypt’s revolution at the end of January. Mansour Barek, supervisor of the archaeological area, emphasized the necessity of providing funds for compensating those whose buildings will be bulldozed and relocating people living in Abu Asaba, north of Kabash Road, whose dwellings encroach on the road. Although the development works in the Avenue of the Sphinxes on Luxor’s east bank is on hold due to lack of funds, it will be officially opened in October, according to original schedule. 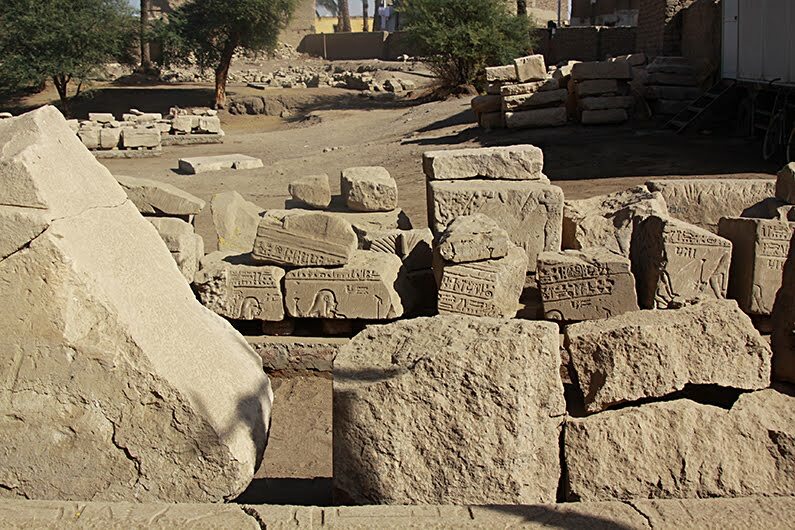 “This is the only way to save such an avenue from further encroachment,” Mohamed Abdel Maqsoud, secretary general of the Supreme Council of Antiquities (SCA), told Ahram Online. He explained that when the development works were put on hold, Luxor’s inhabitants trespassed in the area surrounding the avenue, which threatened the newly discovered antiquities there. Archaeologists have unearthed a number of Roman buildings and workshops used for the manufacture of clay pots and statues, as well as several reliefs. 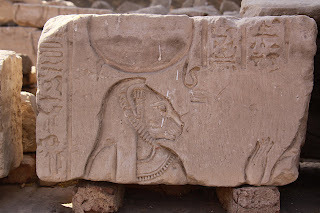 One of the reliefs bears the cartouche of the famous Queen Cleopatra VII (51-30 BC). When the avenue is opened to visitors, says Abdel Maqsoud, all encroachments will stop. To help resume the development work at the avenue, which has already cost LE100 Million, the Ministry of Tourism has offered the SCA LE3 Million. Archaeobotany is the study of ancient plant remains, and I joined the field team at Amara West in Sudan earlier this year to collect samples for archaeobotanical analysis. Charred plant materials were retrieved on-site from sediments through dry-sieving and flotation. These samples were subsequently brought back to the British Museum for further sorting and identification. At the moment I am analysing the charred seeds and fruits with Caroline Cartwright, who is also analysing the wood charcoal. The macroscopic plant remains are analysed using both a stereo microscope and a SEM (scanning electron microscope). Charred remains found so far include cereal grains (wheat and barley) and crop-processing waste, fruits such as figs and a wide range of wild plants. CT scans of suggest this mummy was a male who died at age 40 (a relatively mature age by ancient Egyptian standards), and lived in Lower Egypt sometime between the 20th and 26th dynasties. The images indicate that embalmers removed the man's brain and major organs and replaced them with rolls of linen, a superior embalming method used only for those of high status, researchers at the Smithsonian Museum of Natural History said in a statement. Wrapped in linen and reverently laid to rest, mummies hold intriguing clues to life and death in ancient Egypt and around the world. When this mummy was transferred to the Smithsonian from the Wistar Institute in Philadelphia in the late 1950s, it was partially unwrapped, and very little was known about the individual, until now. The new images suggest the mummy was a male who died at age 40 (a relatively mature age by ancient Egyptian standards), and who lived in Lower Egypt sometime between the 20th and 26th dynasties. Unfortunately there's nothing more than the following, in this article, about the statues that have been recovered. More news should emerge in the next few days. The Egyptian police authority confiscated 22 archeological statutes and spice tools from a suspect who was allegedly trying to make money from selling the artifacts. Abu Zeid Fathy, the accused, was arrested with the pieces. Never mind the cost of bringing the artefacts home - I would have thought that if, as the Step Pyramid story suggested, the SCA is short of the cash required to keep their monuments standing the government would encourage the tour to continue for the benefit of the income. In 2004, when Egypt sent some of Tutankhamun’s collection to Basil city in Switzerland as the first leg of a seven-year touring exhibition abroad, many archaeologists applauded it as a good and free promotion of Egyptian heritage. In addition, some saw it as a possible financial source for restoring monuments and building museums. Meanwhile, some archaeologists fought against the tour, fearing the loss of these distinguished artefacts. Two years later, another part of Tutankhamun’s collection was sent to Los Angeles as the first stop on a six-year touring exhibition abroad. But following the January 25 revolution, and the fall of the Mubarak regime, reassessment of such exhibitions has created friction between those archaeologists who support the tour of artefacts, and those who oppose it. Mohamed Abdel Maqsoud, secretary general of the Supreme Council of Antiquities (SCA), decided to bring the issue before the Antiquities Permanent Committee, the SCA’s Administration Board and the Foreign Exhibition Committee in order to vote on whether to continue the tour of exhibitions or not. It is no secret that the archeological sector has been one of the major sectors adversely affected by repercussions of the January revolution. While some archeological sites have been plundered, because of the low security profile security and the general state of chaos prevailing for several months, work has been suspended on other sites for financial reasons. Excavations on the Avenue of Sphinxes, a key element of the large project to convert Luxor into an open museum, intended to unearth the route that linked the Luxor and Karnak Temple in Pharaonic times, have come to a halt. While visiting the town in May to give impetus to the project, incumbent Prime Minister Essam Sharaf promised that the excavations would be resumed, so that the reclaimed Avenue of the Sphinxes would be inaugurated in October at the start of tourism’s high season. Despite his promise, the situation is at a standstill. Well, unless something else replaces it and communication from Egypt becomes more consistent and fluid, Hawass's blog will be missed. His self-promotion did serve to get some information about antiquities news to the wider world. I am sorry that I have not updated my website for the past several weeks. I have had to spend a great deal of my time dealing with false accusations that have been made against me. I am now waiting for the Office of the Attorney General to finish their investigation; after this I will be free to publish the details of these ridiculous allegations. I am glad to say that I have also found time to work on a book about the Egyptian Revolution, and its effect on our antiquities. I am also getting ready to start the second part of my archaeological autobiography, Secrets from the Sand Part II. My life as a private person is very different from my life as an antiquities official, and apart from having to deal with false accusations, I am enjoying my freedom from the great responsibility I have been carrying for the past nine years. We are presenting to you today the funerary complex of Nyankhnefertem, a.k.a. 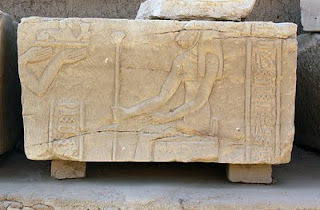 Temi, dating back to the VIth dynasty, at Saqqara. 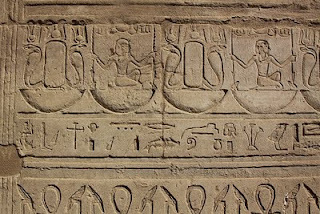 The chapel of this character, who was funerary priest in the temples of the pyramids of Unas and Teti, has been indisputably based on the one of its prestigious neighbour, the vizier Merefnebef (which we have already shown on OsirisNet). Very well preserved, this chapel still has some beautiful polychromic scenes, and the study of the iconographic program points to interesting underlying family rivalries. UCL has made a lot of publications and theses written by students and academic staff available to the public on its website. The above link shows the results for a search on the word "predynastic." There are some good papers, dissertations and theses available. From bards’ tales detailing journeys into the unknown to ancient manuscripts and intricate maps of the world, the legacy of travel narrative in this region is magnificent — at least it was hundreds of years ago. Today, however, travel literature and travelogues written by local writers and native explorers are scarce in Egypt and the region, and the lack is exacerbated by disconnected literature markets, according to observers and industry experts. Because of the nomadic origins of many of the tribes that roamed or settled in the area, from the Arabian Peninsula across North Africa in countries like Egypt, Libya and Tunisia, the culture of movement and the lore associated with it was once prominent. But stories have dwindled, and Egyptian and Arab travelers have ceased to tell tales — most of those who write about ‘us’ are authors from outside the region. Thanks very much to Chuck Jones and his excellent Ancient World Online blog for the above link. Even if you don't speak a word of French, the photographic archives of Maurice Pillet, focusing on early 20th century Egypt, are remarkable. À sa mort en 1964, Maurice PILLET a laissé une somme considérable de matériaux, textes, plans, clichés, et une importante bibliothèque scientifique, concernant notamment l’Égypte et ses travaux dans la vallée du Nil durant près de 40 ans, de 1912 à 1951, surtout à Karnak de 1921 à 1925 lorsqu’il y dirigeait les travaux du Service des Antiquités. En 2006, les héritiers de Maurice Pillet ont fait don de la partie égyptienne des archives, initialement confiée au Centre de Recherches Archéologiques du CNRS à Valbonne, à la Maison de l’Orient et de la Méditerranée-Jean Pouilloux, à Lyon, avec l’accord de toutes les parties concernées. Egypt is a naturalist’s dream. With oceans, oases, deserts and mountains a plenty, you would think eco-tourism would be big here. Much of the nation’s touristic income, however, comes from traditional, block hotel rooms that often do more damage to the environment than highlight it. There is a constant tug-of-war between resort developers and environmentalists over the best way to promote tourism and create jobs in areas noted for natural beauty. The latest battleground is the Fayoum governorate, home to two natural protectorates since 1989. The environmental NGO Nature Conservation Egypt (NCE) and Fayoum-based NGO Friends of Lake Qarun are going after local real estate developer Amer Group over its 2.8-million-square meter Porto Fayoum project. With the North Coast’s Porto Marina and the Red Sea’s Porto Sokhna already under its belt, Amer Group has plans to develop a 10-kilometer stretch of coastal land with another 13 developers along the northern part of Lake Qarun — a project that will generate employment in an impoverished part of the country. The problem, environmentalists say, is that it endangers the Lake Qarun Protected Area and Gebel Qattrani, a desert filled with archaeological and geological remains that was proposed as a UNESCO World Heritage Site in 2003. While the layman in Fayoum would probably welcome the idea of a project bringing in income and job opportunity to the quiet governorate, experts are far less eager. Fayoum is Egypt’s oldest city and is located 130 kilometers southwest of Cairo. It is also home to the 1385-square-kilometer Lake Qarun. The North of the Lake Qarun area has been a protected area since the 1980s, and its boundaries have expanded gradually to include Gebel Qattrani. Still an unspoiled wilderness, the north shore of Lake Qarun is a haven for bird migration; it is classified under BirdLife as an Important Bird Area (IBA), or an area that holds priority in conservation. It also contains one of the world’s most complete fossil records, according to UNESCO, which includes one of the world’s best preserved fossilized whales and Neolithic sites that reveal the evolution of the use of the stone tool artifacts. In a smoky office a short drive from the Pyramids of Giza, Mohamed Saleh, once the director of Cairo’s Egyptian Museum and now the man in charge of the collections for a planned $550 million Grand Egyptian Museum, is asked how much he knows about the bust of Prince Ankhhaf. The precious 4,500-year-old statue, 20 inches tall, left Egypt decades ago and is now on prominent display at Boston’s Museum of Fine Arts. Four words are all Saleh needs. “It is a dream,’’ he says. 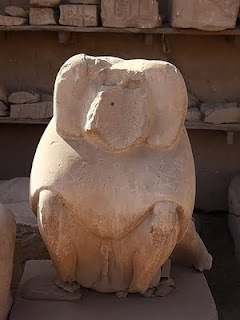 The dream is the idea of the Ankhhaf bust returning from Boston, where it has rested since 1927. The Egyptian government is demanding the statue’s return, and the MFA has refused. But this conflict - one of many the MFA has faced over works in its permanent collection - has been further complicated by the recent tumult in the Egyptian government. And while some claims for ownership of works can be made on legal grounds, this one treads on murkier terrain. The bust of Ankhhaf was given to the MFA by a previous Egyptian government, so the current government has no legal case. Any appeal must be made on moral grounds: that the piece is part of Egypt’s patrimony, and belongs at home. The Mediterranean Archaeological Network (MedArchNet) is a series of linked archaeological information nodes, each of which contains a regional database of archaeological sites that share a common database structure in order to facilitate rapid query and information retrieval and display within and across nodes in the network. The Mediterranean Archaeology Network or MedArchNet is one of the first attempts to create 'Portal Science' for archaeologists and the interested public. Consequently, a major goal of MedArchNet is to make archaeological data from the Mediterranean lands accessible to various communities, including school teachers, tourists and travel agents, university students and professors, researchers, and public policy makers. MedArchNet taps into the fast-growing field of 'portal science' and will serve researchers and explorers as a platform for international collaboration, while also allowing the general public to share in the excitement of archaeology and discovery. Various portals will be used by these communities. Archaeological data will be accessed and displayed over the Internet through existing tools such as Google Maps/Google Earth and emerging visualization technologies such as Calit2's HIPerSpace large-format display systems suitable for museum and other public display environments. A key component in this regard is user access to the data using smartphones. Interested individuals could download content about particular cultural heritage sites in MedArchNet on their cell phone in preparation for visiting a site, or while actually there. To date, our most advanced atlas node is DAAHL - the Digital Archaeology Atlas of the Holy Land. I am currently in mid west Wales. I ordered a book from an Amazon marketplace seller on Old Kingdom art to be delivered to the house here, and was delighted, when it arrived, to find a note with it from the bookshop owner, Karl Eynon, to inform me that he has a second hand bookshop based in the next village along from mine. So yesterday I went into Tywyn (Gwynedd) to see what he had in stock. The shop is a charming white cottage on the sea front, set back from the road. Called Town and Gown Bookshop Cafe it has books from carpet to ceiling in every room on both floors. As well as covering a large range of other topics, it has a great selection of history and archaeology books from 19th and 20th centuries including a large number of Egyptology books. I bought a stack of them, including three issues of the African Archaeological Review, Griffith and Thompson's "The Leyden Papyrus" and an unused copy of Murnane's "The Penguin Guide to Ancient Egypt" which is, in my humble opinion, the best guide to the archaeological sites of AE. Bookshops in the UK are dying out fast thanks to the benefits offered by online sellers. It was therefore a rare pleasure to rummage through all these old books, (some of them completely obscure, some of them classics), and to enjoy the experience of finding so many random gems in such an unlikely place. I don't suppose that many of my readers will find themselves in mid west Wales very often, but if you do I seriously recommend the joys of a proper second hand bookshop (Town and Gown Bookshop Cafe, Marine Parade, Tywyn, LL36 0DG). Photographs copyright Town and Gown Bookshop and Cafe. Thanks to Jan Picton for the news that the Petrie Museum is co-operating in an interesting new project. Called “African Combs: 5000 years of culture, politics, and identity,” a multi-disciplinary project at the Fitzwilliam Museum, Cambridge, aims to trace over 5000 years of history of the African Comb from the Predynastic period in Egypt to the twentieth century in the UK and US. The project will include oral histories and personal testimonies that will document attitudes towards hair and grooming in the present day. Recording personal stories relating to hair combs and hair is a crucial part of this project. To get involved at the Petrie Museum, watch for up coming workshops and focus groups on hair combs. If you can't get to the museum you can still participate. Anyone interested in taking part in the project should contact Sally-Ann Ashton on 01223 332905, or e-mail SA337@cam.ac.uk, and for more information check their website, above. For nearly 12 years, the Agha Khan Trust for Culture (AKTC) has been leading an exemplary development initiative in the historic neighborhood of Al-Darb Al-Ahmar (ADAA) in Cairo. An overview of this unprecedented experience in Egypt highlights issues of sustainable development practices in general, with a special focus on historical districts. Al-Darb Al-Ahmar is a popular neighborhood part of historic Cairo. It surrounds Al-Azhar Park on its western edge, an area where a 1.5 kilometer long portion of an Ayyubid wall was revealed by the removal of accumulated rubble. While there is a wide-ranging literature on the subject of excavation methods on the one hand, and of excavation reports on the other, the topic of recording in archaeology—which forms the crucial link between these two—is not very widely discussed, even within publications on method and theory. Therefore, the book under review makes an extremely valuable contribution to the topic of archaeological method and theory. It describes the state of art in the sphere of recording systems, and discusses important topics in their history and development. This book is based on the author’s 2009 University of Bucharest Ph.D. dissertation. In his study, Pavel discusses various aspects of archaeological recording systems, considering them as a linking element between fieldwork and archaeological theory. The work is based on an analysis of more than sixty case-studies presented in the book as an illustrated catalog. The geographical scope of the research includes (with three exceptions) Western European, Near Eastern, and American field projects. The monograph has two major parts: The first is theoretical and comprises chapters I-VII. The second half of the book is a catalog of case-studies (chapter VIII) and their summary in chapter IX. The introduction describes the scope and research questions of the present study, and provides the reader with definitions of basic terminology (additional useful explanations are in the summarizing chapter IX). The author begins the monograph with the explanation of the importance of recording in archaeology, and proceeds to a very detailed, well-studied and interestingly written history of archaeological recording in Chapter II. This thesis examines a little understood aspect of Dynastic Egypt—that of the ideology of flint. Ideology is defined as the way flint is thought of rather than used. This study is unique in examining long term chronological changes in flint ideology against the background of increased metal use, and in using together text, iconography, and archaeology: studies of Egyptian ideology traditionally privilege text. Metaphor theory is employed as an important tool to aid this study. While metaphor is frequently used in Egyptological studies of Egyptian religion, its use is rarely explicit. The dataset brings together unpublished artefacts in British museum collections; a first hand analysis of lithics from Panhesy’s house at Amarna; finds cards from recent excavations at Memphis; and textual sources, several of which have not been considered before in relation to the ideology of flint; as well as published data on Egyptian lithic material. Chronological changes in ideology surrounding flint during the Bronze and Iron Ages, a time of flint decline, are considered. Because the nature of flint decline in Egypt has been assumed rather than known, I attempt to quantify the process. Conclusions show that the ideology of flint was far from static but only loosely related to the kinetic decline of flint. 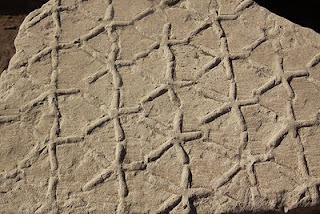 Flint is shown to be connected with the goddesses who are the Eye of Re, with Re himself, with snakes and lions. New facets of flint ideology are uncovered, including the connection of the material with the northern sky and the link between the treatment of New Kingdom Theban flint concretions and the religious landscape of the area. The date is now confirmed as Friday 25th November and there will be more details in the mailing. However, you can help us by sending me any favourite photograph you have of Bob (either Egypt related or social), preferably as a jpeg, for display on the night. If you already know that you won't be able to make this date but would like to send us a story about Bob, we'll include it on the memory wall. This is going to be a celebration so come prepared for a party and to give Bob a send off that he would have enjoyed. You don't have to be a member of the Friends to participate. Un equipo de arqueólogos egipcios ha descubierto una estela que data de la época del faraón Apries de la XXVI dinastía (589-570 a.C.) en la provincia de Ismailiya, al este de El Cairo, informó hoy el Consejo Supremo de Antigüedades (CSA). La pieza consta de dos partes de piedra arenisca roja que tienen esculpidas dos cartuchos con el nombre en jeroglíficos del rey Apries, quinto monarca de la dinastía XXVI, precisó el secretario general del CSA, Mohamed Abdel Maqsud. En un comunicado, el responsable egipcio indicó que el hallazgo fue llevado a cabo en el yacimiento arqueológico de Tel Dafnah, ubicado en el lado oeste del Canal de Suez, en las proximidades de la ciudad Al Qantara del Oeste. Los dos fragmentos tienen varias inscripciones en alfabeto jeroglífico, y el de mayor tamaño constituye la base de la estela con una altura de 1,63 centímetros, una anchura de 85 y un espesor de 58. Roughly: The SCA have announced that a team of Egyptian archaeologists have discovered a stela dating to the time of Pharaoh Apries of Dynasty XXVI (589-570 BC) in the province of Ismailiya, east of Cairo at the site of Tel Dafnah (near Qantara West). The red sandstone stela is in two parts, carved with hieroglyphs including the king's name in cartouches. SCA head Mohamed Abdel Maqsud. It was thought to have come from a large temple at the site. Maqsud says that the archaeological findings in this field have found that Tel Dafnah was not only a former military fortress of Greek mercenaries, but a settlement Egyptian built by the pharaoh erected Psamtik I, second king of Dynasty XXVI. 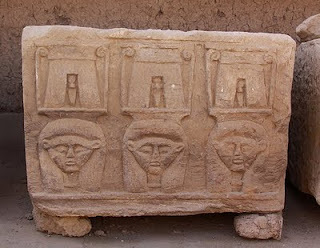 The Egyptian Military Operations Authority on Tuesday discovered the nameplate of King Apries in the Tal Defna area in Ismailia, which is located to the west of the Suez Canal. The plate is made up of two pieces of red sandstone with two cartouches bearing the name Wah-ib-ra (Apries ) inscribed. Apries (589-570 BC) was the fifth king of the 26th Dynasty. Secretary General of the Supreme Council of Antiquities Mohamed Abdel Maqsoud said the plate was transferred to storerooms in Ismailia. Abdel Maqsoud went on to say that the two pieces were covered in hieroglyphics, whereas the base was free of any writing or carvings. The new Galleries of Ancient Egypt and Nubia (modern-day Sudan) will open on 26 November and feature the Ashmolean’s Egyptian collections and objects that have been in storage for decades. Architectural and interior design is being led by Rick Mather Architects and the practice is working with the Ashmolean’s design department on exhibition design, with the in-house team also developing interpretation design. DHA Design is working on lighting design for the galleries. El Ministerio de Cultura, a través del Instituto del Patrimonio Cultural de España, ha iniciado el proceso de restauración de 175 piezas de la colección de antigüedades egipcias del Museo Arqueológico Nacional que próximamente volverá a formar parte de su exposición permanente. Las piezas están principalmente relacionadas con el mundo funerario: cerámicas y paletas de esquisto del IV milenio, estelas de falsa puerta del Primer Periodo Intermedio, mesas de ofrendas, vasos canopos, ushebtis, barcas de madera, terracotas, lucernas, cerámicas y amuletos pertenecientes a diferentes ajuares funerarios. Elementos singulares de la colección son también las momias y los útiles relacionados con el proceso de momificación. Entre otros: vendas, cartonajes policromados y dorados y mallas o vestimentas ornamentales de los difuntos realizadas con canutillos de pasta vítrea. Roughly: The Institute of Cultural Heritage of Spain has started to restore 175 pieces from the collection of Egyptian antiquities in the National Archaeological Museum. They will soon be part of its permanent exhibition. The pieces are mainly funerary: ceramics and slate palettes of the fourth millennium, false door stelae of the First Intermediate Period, offering tables, canopic jars, ushabtis, wooden boats, terracottas, lamps, pottery and amulets. “Egyptian Gold in Prepalatial Crete? A Consideration of the Evidence” by Cynthia S. Colburn, Pepperdine University. “ ‘Stop, O Poison, that I May FindYour Name According to Your Aspect’: A Preliminary Study on the Ambivalent Notion of Poison and the Demonization of the Scorpion’s Sting in Ancient Egypt and Abroad” by Panagiotis Kousoulis, University of the Aegean. Nicola Laneri, editor, with contributions by Nicola Laneri, Ellen F. Morris, Glenn M. Schwartz, Robert Chapman, Massimo Cultraro, Meredith S. Chesson, Alessandro Naso, Adam T. Smith, Dina Katz, Seth Richardson, Susan Pollock, Ian Rutherford, John Pollini, John Robb, and James A. Brown. is a staggering collection of pieces! The newly appointed Secretary General of the Supreme Council of Antiquities of Egypt Mohammad Abdel-Maksoud announced Sunday that a committee has decided to make funds available to restart restoration work on the Zoser pyramid. Local media had claimed the inside of the pyramid was falling down, following a default in payment to the company that was operating the restoration works. A statement from the council said that a technical committee met Sunday, and decided that payments would be in three phases with a priority for the workers’ salaries and for the delayed company payments. La grave crisis financiera que afecta al Consejo Superior de Antigüedades (CSA), debida en gran parte a la ausencia de turistas en Egipto, podría acarrear el derrumbamiento de la pirámide escalonada de Zoser, la más antigua de la historia, cuya rehabilitación ha quedado interrumpida. "El problema es que no hay dinero, porque éste llegaba del turismo extranjero. Después de la Revolución del 25 de enero, la afluencia de turistas al país disminuyó seriamente y, por tanto, los ingresos de los sitios arqueológicos bajaron", dijo en declaraciones a Efe el secretario general del CSA, Mohamed Abdel Maqsud. Sin embargo, adelantó que mañana, domingo, visitará al frente de un equipo de expertos la pirámide, ubicada en la zona arqueológica de Saqara, unos 25 kilómetros al suroeste de El Cairo. Roughly: According to Mohamed Abdel Maqsud the lack of tourists has led to a severe financial crisis in the Supreme Council of Antiquities (SCA), caused by reduced ticket sales at sites. This could in turn lead to the deterioration of the step pyramid of Djoser, the renovation of which has been interrupted. Nevertheless he announced on Sunday that a team would be going to the site to review the situation. After four years of restoration the roof remains the last part of the project to need completion but the work was halted when the company carrying out the work was not paid. The monument appears to be in serious danger of collapse. The head of the restoration project, Samir Abdel Rauf, said in a statement to the Egyptian press that the suspension of work can lead to detachment of blocks from the roof of the pyramid. Temporarily fixed into place with the use of "pillows of air," follow-up work is required to avoid their detachment. The SCA will try to find the funds to complete the work. The allegations could have come straight out of an Indiana Jones movie. 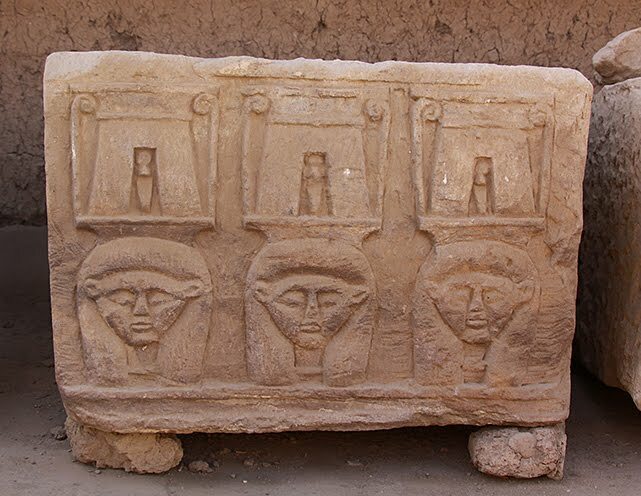 Three art dealers and a collector have been accused of running an antiquities smuggling ring that illegally shipped Egyptian treasures, including Egyptian sarcophagi, funerary boats and limestone figures over 2,000 years old, to the United States. The relics arrived stateside in innocuous freight boxes, labeled "antiques" and "wooden panels," in order to escape scrutiny. Declared "one of the largest and most-significant cases of antiquities smuggling in recent memory" by Egypt's minister of antiquities, the case provides a reminder that the "Arab Spring" may have facilitated trade of a treasure trove of stolen assets in the world's art and antiquities markets – and that increased diligence is needed to ensure that our world's cultural heritage is protected. In the recent indictment, the US department of justice charged Mousa Khouli, Salem Alshdaifat and Ayman Ramadan, and collector Joseph A Lewis II, with conspiring to smuggle artifacts and conspiring to launder funds. The men are said to have collaborated in disguising and transferring ancient Egyptian artifacts, sidestepping international treaties and domestic customs laws, and abandoning moral restraint. The case against Khouli and his co-accused draws attention to the global market for looted treasure. The pieces were up for sale in a specialized auction house when a British Museum trustee stopped the auction and confirmed that the pieces were genuine. A team of English, Egyptian and German researchers was formed to examine the artifacts, which proved their origin. The pieces had been removed from the base of an ancient statue of Amnehotep III in his mortuary temple in Luxor, the statement said. The Egyptian governorate of Luxor witnesses a state of stability and security after two months of chaos and instability, said the chairman of the Chamber of Tourism Commodities and Bazaars, Ihab Qedis. The governorate witnessed instability because of intensive presence of vendors and thugs in touristic areas during the past period. The head of Egypt’s Supreme Council of Antiquities has approved certain requests by the Tour Guide Union in Luxor, Upper Egypt to revitalize tourism. Mohamed Abdel Maksoud, Secretary General of the SCA, approved some proposals aiming at revitalizing tourism in light of current circumstances in the country. Hidden beneath an ancient palace in what is now central Sudan, archaeologists have discovered the oldest building in the city of Meroë, a structure that also may have housed royalty. The capital of a vast empire that flourished around 2,000 years ago, Meroë was centered on the Nile River. At its height, the city was controlled by a dynasty of kings who ruled about 900 miles (1,500 kilometers) of territory that stretched from southern Egypt to areas south of modern-day Khartoum. People of Meroë built palaces and small pyramids, and developed a writing system that scholars still can't fully translate today. Although Meroë has been excavated off and on for more than 150 years, archaeologists are not yet clear on how it came to be. The city seems to have emerged out of nowhere.